This article is about Feast of Christ the King. For the title of Christ, see Christ the King. The Solemnity of Our Lord Jesus Christ, King of the Universe, commonly referred to as the Feast of Christ the King, is a relatively recent addition to the Western liturgical calendar, having been instituted in 1925 by Pope Pius XI for the Roman Catholic Church. In 1970 its Roman Catholic observance was moved to the final Sunday of Ordinary Time. Therefore, the earliest date on which it can occur is 20 November and the latest is 26 November. Traditional Catholics observe it on its original date, the last Sunday of October. The Anglican, Lutheran, and many other Protestant churches adopted it along with the Revised Common Lectionary. It is also observed on the same computed date as the final Sunday of the ecclesiastical year, the Sunday before the First Sunday of Advent, by Western rite parishes of the Russian Orthodox Church Outside Russia. 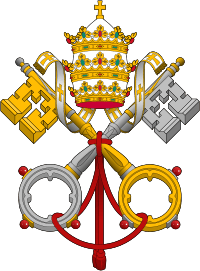 Roman Catholics adhering to the Extraordinary Form of the Roman Rite as permitted under the motu proprio Summorum Pontificum use the General Roman Calendar of 1960, and as such continue to observe the Solemnity on its original date of the final Sunday of October. 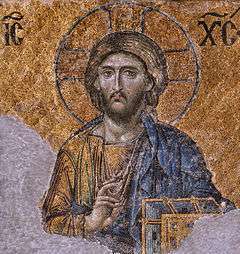 Jesus Christ in Hagia Sophia. Pope Pius XI instituted the Feast of Christ the King in his encyclical letter Quas primas of 1925, in response to growing secularism and in the context of the unresolved Roman Question. According to Cyril of Alexandria, "Christ has dominion over all creatures, ...by essence and by nature." His kingship is founded upon the hypostatic union. "...[T]he Word of God, as consubstantial with the Father, has all things in common with him, and therefore has necessarily supreme and absolute dominion over all things created." The feast has an eschatological dimension pointing to the end of time when the kingdom of Jesus will be established in all its fullness to the ends of the earth. It also leads into Advent, when the Church commemorates the arrival of the newborn king. The title of the feast was "Domini Nostri Jesu Christi Regis" (Our Lord Jesus Christ the King), and the date was established as "the last Sunday of the month of October – the Sunday, that is, which immediately precedes the Feast of All Saints". In Pope St. John XXIII's revision of the Calendar in 1960, the date and title were unchanged but, according to the simplification of the ranking of feasts, it was classified as a feast of the first class. In his motu proprio Mysterii Paschalis of 1969, Bl. Pope Paul VI amended the title of the Feast to "D. N. Iesu Christi universorum Regis" (Our Lord Jesus Christ King of the Universe). He also moved it to the new date of the final Sunday of the liturgical year, before the commencement of a new liturgical year on the First Sunday of Advent (the earliest date for which is 27 November). Through this choice of date "the eschatological importance of this Sunday is made clearer". He assigned to it the highest rank of "solemnity". As happens with all Sundays whose liturgies are replaced by those of important feasts, The prayers of the Sunday on which the celebration of the Solemnity of Christ the King occurs are used on the ferias (weekdays) of the following week. The Sunday liturgy is thus not totally omitted. In 2016, the Solemnity day falls on 20 November (or 30 October for those using the traditional calendar). The liturgical vestments for the day are colored white or gold, in keeping with other joyous feasts honoring Christ. Those churches that use the Revised Common Lectionary observe Christ the King Sunday as the final Sunday of their liturgical years. These churches include most major Anglican and mainline Protestant groups, including the Church of England, Episcopal Church, Anglican Church in North America, Evangelical Lutheran Church in America and other Lutheran groups, United Methodist Church and other Methodist groups, Presbyterian Church (U.S.A.), the United Church of Christ, and the Moravian Church. In the Evangelical-Lutheran Church of Sweden, this day is referred to as the Sunday of Doom, previously highlighting the final judgement, though after the Lectionary of 1983 the theme of the day was amended to the Return of Christ. In the Church in Wales, part of the Anglican Communion, the 4 Sundays before Advent are called the "Sundays of the Kingdom" and Christ the King is observed as a season and not a single festal day. ↑ "Liturgical Calendar for the Dioceses of the United States of America". United States Conference of Catholic Bishops. 2014. 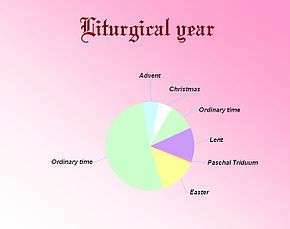 ↑ "Liturgical Calendar 2015". The Latin Mass Society of England and Wales. 2015.